Artists including Jake and Dinos Chapman, John Cooper Clarke, Laure Prouvost, Linder Sterling and Robert Montgomery will take part in “global poster project” Time For Outrage! The project gives artists and members of the public the chance to “voice what they are outraged about in the world today”. In London, the team behind Time For Outrage! have announced the takeover of a “major wall space” in London which will see traffic of around 2.1million passers-by every month. From 18 July – 1 September, the billboards of Great Eastern Wall Gallery on Shoreditch’s Great Eastern Street become a temporary exhibition space, with the campaign extending to Berlin, Athens, Moscow, Istanbul, Mexico City and New York City and concluding on 11 December 2018, international Human Rights Day. Time For Outrage! is supported by independent not for profit organisation Gaia Art Foundation. 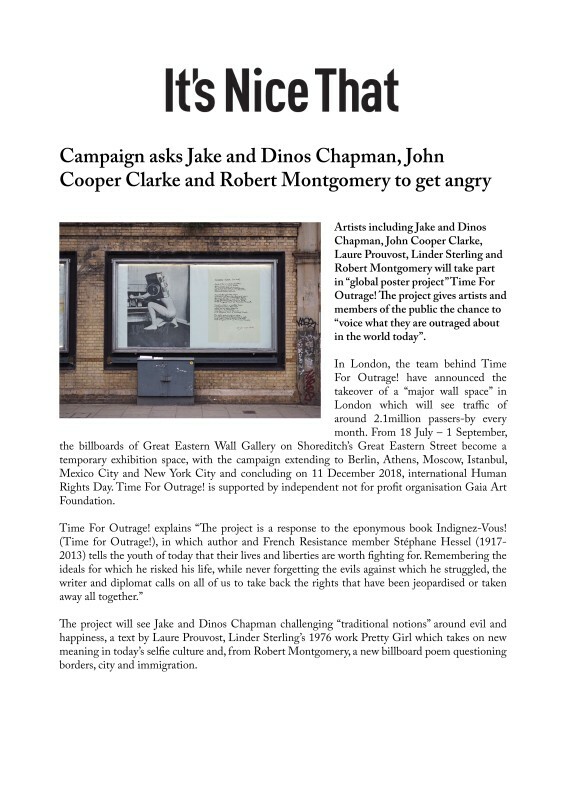 The project will see Jake and Dinos Chapman challenging “traditional notions” around evil and happiness, a text by Laure Prouvost, Linder Sterling’s 1976 work Pretty Girl which takes on new meaning in today’s selfie culture and, from Robert Montgomery, a new billboard poem questioning borders, city and immigration.